The 14kt white gold Ava mother's ring offers your choice of four simulated 2.0mm round birthstones, and one 7 x 3.5mm navette center stone. Bring out the diva in Mom with the bold styling of the Ava ring! 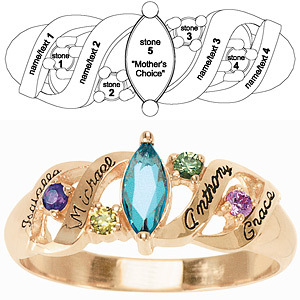 Engrave up to 10 characters per engraving area. Import.